ABSTRACT: When most people think of species interactions we think of the obvious ones, such as predation, competition, and parasitism, and how these shape species coevolution and communities. When we think of how animals choose their mates we think of sexual selection, with (usually) females choosing amongst males for the highest quality, and (usually) males competing with each other for these mating opportunities. I will show how these two seemingly disparate areas in ecology and evolution come together to reveal important insights into how biodiversity may arise. Using experimental and field-based studies, I will demonstrate how co-existing with other species can change who you choose to mate with, and that this has a knock-on effect of causing populations to diverge. I will also discuss how this process can be broadly extrapolated across many types of species interactions and systems, and may well be an important driver of diversification. BIO: Megan Higgie received her BSc from the University of Auckland, and then headed across the Tasman to begin her research career at the University of Queensland. At UQ, both her Honours and PhD research (with Mark Blows) focussed on how species interactions changed mate choice within a species – a question Megan continues to be fascinated with. 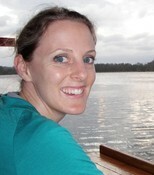 Following her PhD, Megan won an ARC Postdoctoral Fellowship, which she took at the Australian National University. Near the end of this fellowship Megan headed to the Tropics to take up a lectureship in the School of Marine & Tropical Biology at James Cook University. She is now an ARC DECRA Fellow and her research involves native Drosophila, rainforest frogs, and, funnily enough, frog-biting flies.